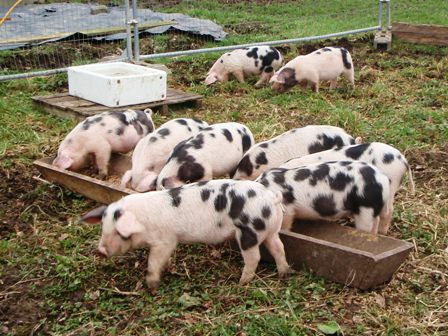 Gloucestershire Old Spots Pork and Bacon The biggest single factor in the regeneration of the GOS breed has been the increasing awareness of the eating qualities of its produce and the growing niche market as a result. The LACORS ruling follows in full. It covers not only GOS but the produce of all livestock other than cattle so other breeds of pigs and sheep etc. The ruling applies not only to supermarkets but to anyone selling or offering for sale meat via butchers, farm shops, Farmers Markets, farm gate or via the internet. If you are selling meat from GOS pigs, please ensure that you comply with these regulations as our members are encouraged to report any suspicions they may have to Trading Standards to investigate. The simplest way to comply is to birth notify and tattoo every pig you breed. This will allow you to download free of charge from the BPA website, the Meat Certificate which will authenticate the provenance of the meat you are marketing. If you become aware of anyone offering meat that you believe not to be from pedigree stock, contact your local Trading Standards Officer and ask them to investigate. Point out the following document to them if necessary and if they seem unsure of how to verify pedigree status, point them in the direction of the online pedigree records at www.britishpigs.org.uk. The Gloucestershire Old Spots breed name is our inheritance and we must protect it for future generations. Every pedigree GOS pig can be traced back to the original pigs first registered before the First World War. They are the only creatures on this planet that can legitimately be called ‘Gloucestershire Old Spots’. Help us to ensure that this is maintained both by sticking to these simple rules and reporting anyone you find who isn’t. Here is the official ruling in full. It applies equally to all pig and sheep breeds, not just GOS. LACORS has been asked to provide guidance on appropriate labelling and descriptions to be applied to meat other than beef (e.g. pork chops, pork joints, lamb chops, lamb shanks etc) and meat products (e.g. bacon) to which a specific breed (e.g. Gloucestershire Old Spot Pig*- note the abbreviation GOSP is used to describe this breed in this guidance) is attributed either on the labelling or in accompanying promotional material or both. 3. At issue is whether the consumer is adequately informed as to the true nature of the product before making a decision to purchase. There is no problem where the product results from the mating of a pedigree boar and sow of the same named breed but there are issues when the sow is not from the same pedigree breed itself but is a commercial hybrid or another specific breed. 1. LACORS takes the view that product labelling by breed should be sufficient to explain to the consumer what the true nature of the product is and to enable what appear to be identical but which in practice are different products to be adequately distinguished. It is a basic principle behind food labelling and consumer protection legislation that sufficient information is provided so that the consumer is not misled. 2. In this respect the consumer will wish to be aware of the origin of the product, that is to say whether the resulting product is derived from the mating of a pedigree GOS boar with a pedigree GOS sow or the mating of a pedigree GOS boar with a commercial hybrid sow. 4. Statements A and B are more likely to be considered to be the true names of the products whereas statements C, D and E are more likely to be considered to be statements accompanying and expanding upon the true name. Statement A or B should be used, whereas Statements C, D or E may be used in addition to either A or B. 5. Any reference to a specific breed should refer to an animal registered by an officially recognised registration authority licensed by DEFRA, for example the British Pig Association. 6. If the produce is not from two pedigree registered pigs (or other species) of the same breed, any photographs or illustrations shown on labels, point of sale materials, advertisements or supporting literature should be clearly captioned with the words in paragraph 3 (A or B) above. Such captions should be clear and in the same weight and size of font as the most prominent font used elsewhere on the packaging. 7. The names and qualifying statements should be given prominence in the label. 8. This guidance applies equally to produce labels where such products are sold loose or pre-packed or pre-packed for direct sale and the same information about the true nature of the product should be repeated by means of accompanying tickets or generic notices where applicable and on any promotional literature or advertising material. It would be best practice to follow this guidance in catering establishments. 9. Any trade mark applied to the products should not be similar to the name of the breed in question. 10. Although this guidance uses Gloucestershire Old Spot pigs as an example the same basic principles apply to other species and breeds. 11. This guidance has been developed and approved in consultation with the representatives for the farming and supply industry.